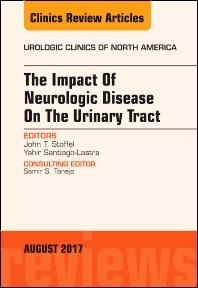 The Guest Editors have assembled expert authors to provide clinical reviews on the current knowledge about the impact of neurologic disease on the urinary tract. Specific articles are devoted to the following topics: The Cost of Care in Neurogenic Lower Urinary Tract Dysfunction; How to Measure Quality of Life Concerns in Patients with Neurogenic Lower Urinary tract Dysfunction; Long-term Complications of the Neurogenic Bladder; Surveillance Strategies for Patients with Neurogenic Bladder; Establishing a Multi-disciplinary Approach to the Management of Neurologic Disease affecting the Urinary Tract; Evaluation and Lifetime Management of the Urinary Tract in Patients with Myelomeningocele; Contemporary Treatment of Post-Stroke Lower Urinary Tract Dysfunction; Parkinson’s Disease and its Effect on the Lower Urinary Tract: Evaluation of Complications and Treatment Strategies; Management of the Neurogenic Bladder in Patients with Multiple Sclerosis; Identifying the High-Risk Neurogenic Bladder after Spinal cord Injury; Peripheral and Sacral Neuromodulation in the Treatment of Neurogenic Lower Urinary Tract Dysfunction; Disease-specific Outcomes of Botulinum; Toxin Injections for Neurogenic Detrusor Overactivity; Surgical Management of Neurogenic Lower Urinary Tract Dysfunction; Tissue Engineering Strategies for Neurogenic Lower Urinary Tract Dysfunction; Mending Gaps in Knowledge: Collaboratives in Neurogenic Bladder Research. Readers will be able to employ this clinical information in the treatment and management of their neurologic patients.